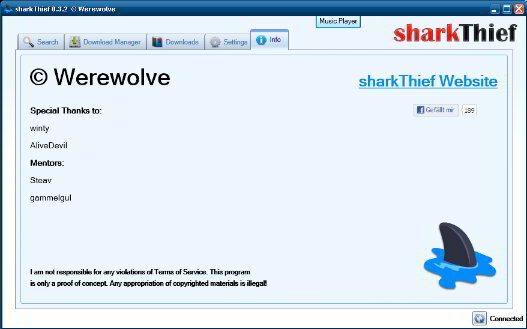 sharkThief is a Grooveshark downloader with many features. This little tool allows you to download multiple streams from Grooveshark quickly and easily. The advantage is that you don't have to call up the website but can right away in the program download any song and play a preview. With a advanced song search you can find any song and batch download many songs at one time. Therefore you reach higher speeds as in other Grooveshark downloading tools. The songs are in top quality and the download speed is very fast. The program require .net frameworks 3.5 and runs on any Windows version.